Kukaktlim Fork Goodnews Fly-Fishing Trip. 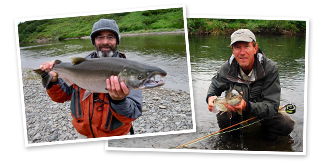 50 wild miles of Rainbow, Char, Sockeye, Kings & Wildlife. Showery weather but flyable. From time to time the mountains were partly obscured by rain showers as our Pilots, Rick Grant and Mike Hink picked their way through the mountain passes toward the Goodnews. It was fun to contrast the stories that Ralph Steven’s family has of their many years flying in the African Bush with this flying. We saw a Moose below us and hundreds of lovely streams and rivers, all of which looked exceptionally “fishy”. We set up rafts and shoved off downstream. 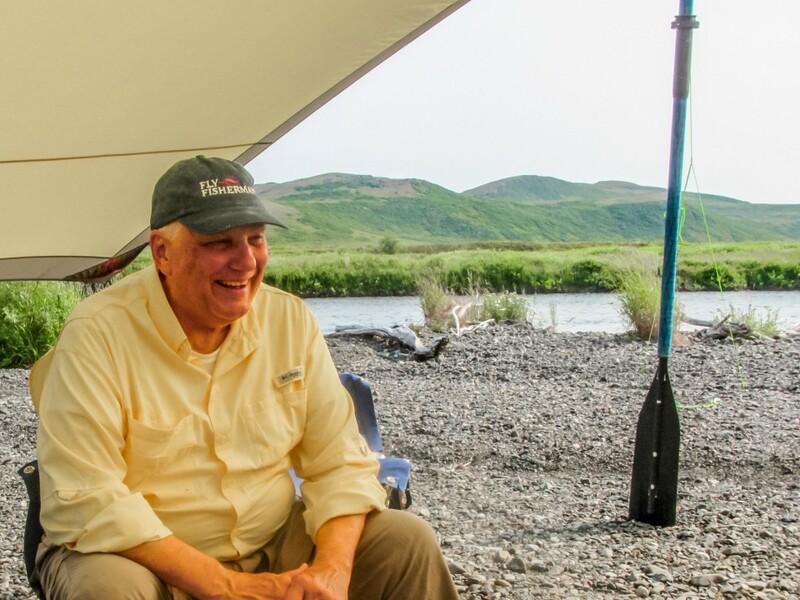 What followed was very exciting even for seasoned Alaskan travelers. 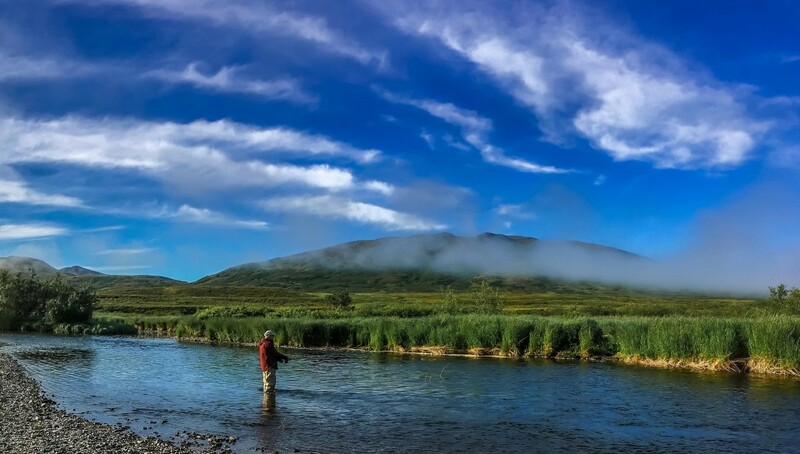 The outlet and first several miles of the Kukaklik Fork were loaded with migrating Sockeye in chrome condition. 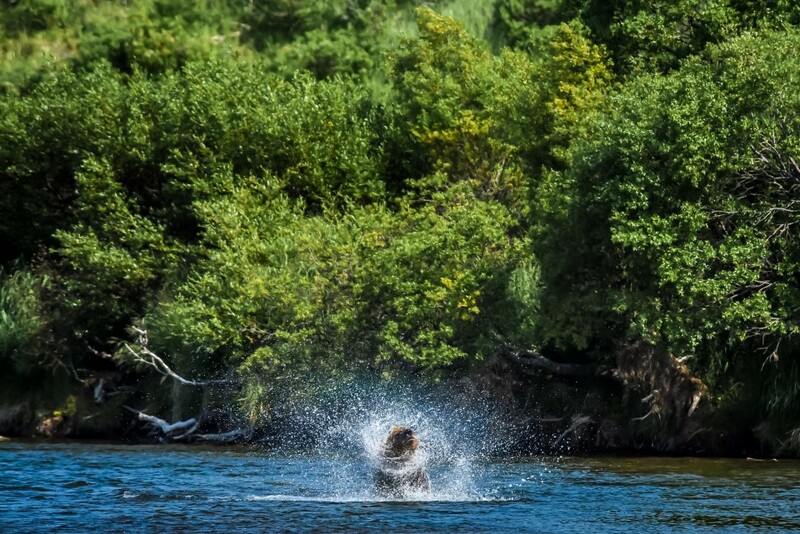 The water was rarely more than 6 inches deep and everywhere you looked were explosions of water as the salmon “spurted” up though the shallows or conversely rocketed downstream to the last deep pool. The water was in constant motion as thousands of powerful salmon blasted past our rafts with their dorsal fins exposed and churning whitewater with their tails. 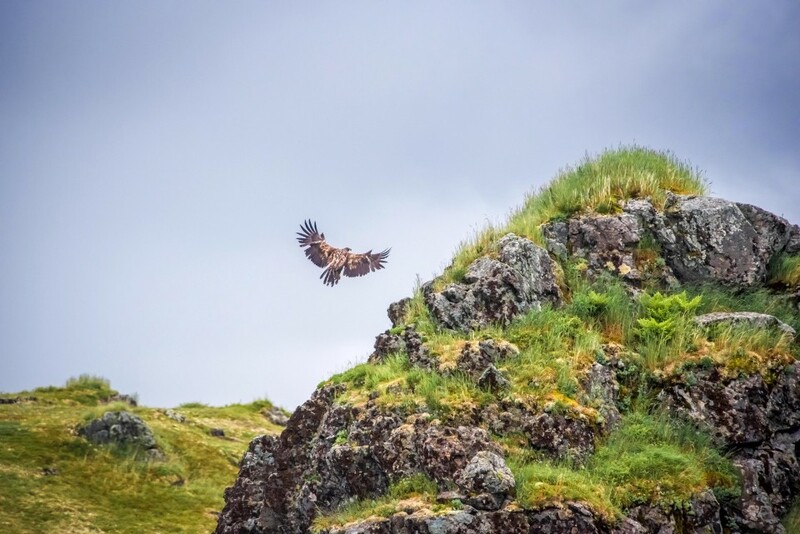 We watched 2 immature Bald Eagles land and perch on the prominent rock walls of a diminutive canyon as we passed by. An Ouzel, or more properly an “American Dipper” was spotted at close range, plus several Green-winged Teal, a dozen Mergansers, and 2 Harlequin ducks. Then in early evening we unloaded the rafts and set up our first camp on a gravel bar with a long vista of the alpine tundra terrain. That evening anglers took Arctic Grayling and Rainbows and Geoff Stevens landed a really extraordinary trophy Rainbow Trout. Perhaps the fish of a lifetime! The moist weather pattern we’d flown through cleared overnight and the morning was cold with patches of fog, which typically is a fair weather indicator of higher barometric pressure. 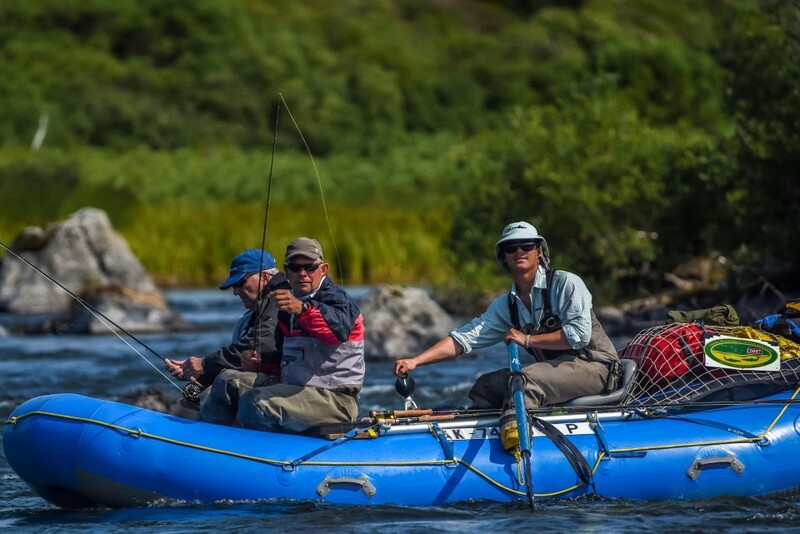 We rafted and fished down stream through thousands of migrating Sockeye with a sprinkling of King and Chum Salmon. It was noted that some of the Chums were paired up over clean spawning gravel, which marks the beginning of the salmon-spawning season for 2017. 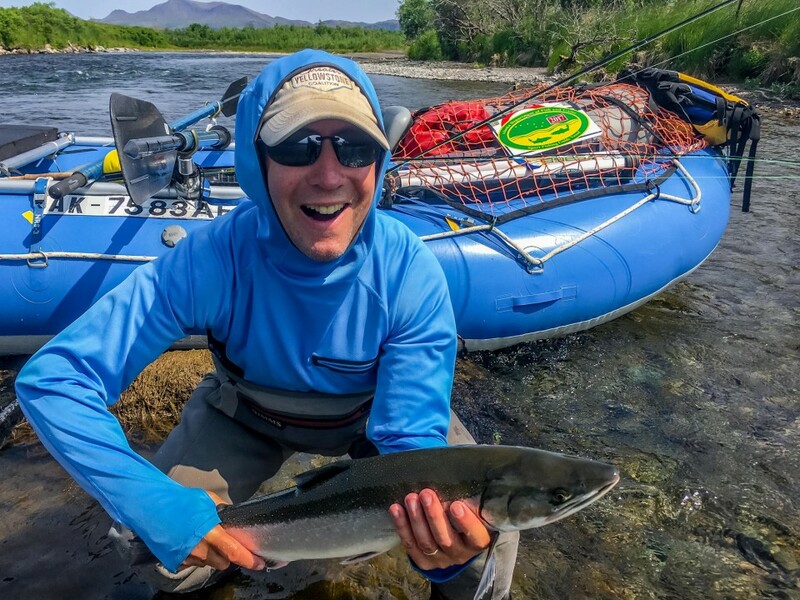 Jim Busick took the first Sockeye, Paul Eldrenkamp released the first King Salmon of the season, and Mike Wyant retained his Jack King Salmon for dinner. 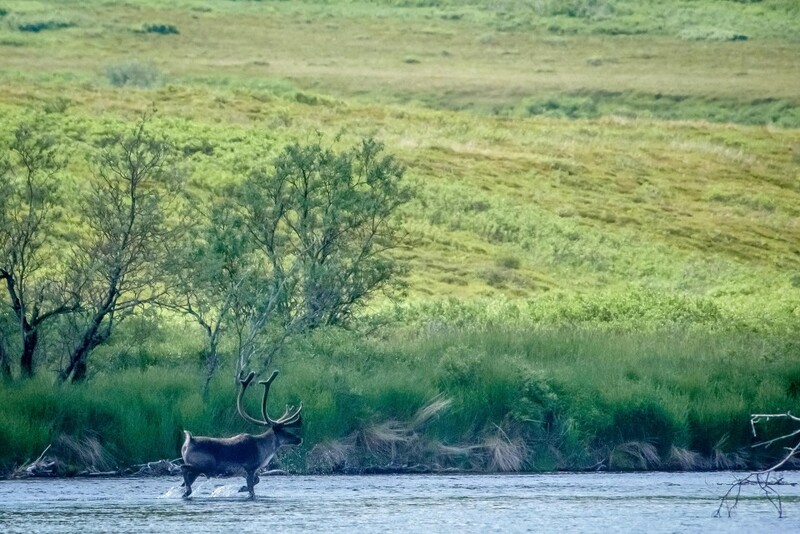 The day fished really well, the scenery was spectacular and a fine bull Caribou crossed the river at a good range for observations. Another observation was of a single American Robin. One wonders if they are extending their range into the tundra as the climate and vegetation change in this region? 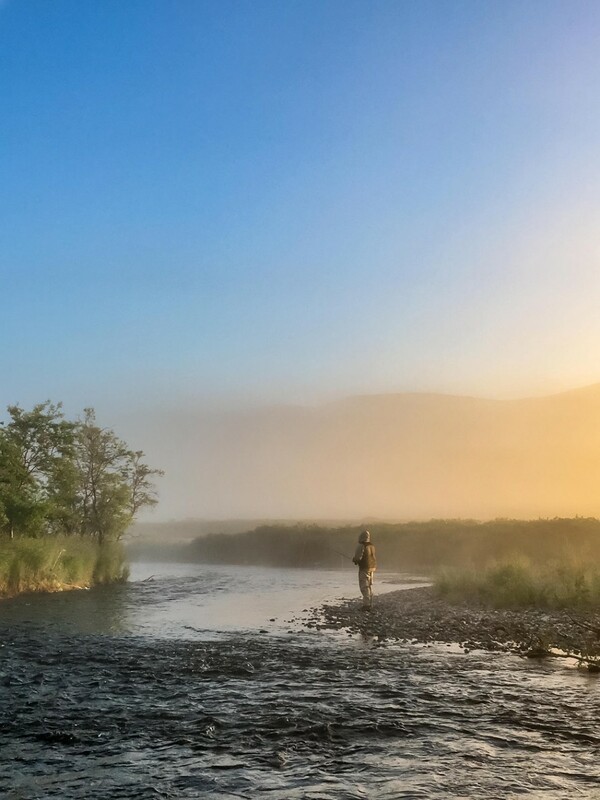 Amazing Rainbow Trout fishing! Enough King hookups to keep it interesting. The biggest run of Kings that I’ve ever seen on this fork and really strong Grayling numbers including 3 very large fish taken in the heavy standing waves of a King Salmon spawning reach. They were athletic Grayling! By days end we’d travelled 20 miles since our aircraft drop off yesterday and we camped on a lovely gravel bar. The water clarity was perfect, gin clear. We were a happy camp. Sunny and mild with querulous Magpies scolding from the riverside Willows. A Red Fox spotted across this narrow stream from camp. Other wildlife included 1 Northern Harrier, which is a raptor common to this tundra environment plus two Brown Bears seen today. 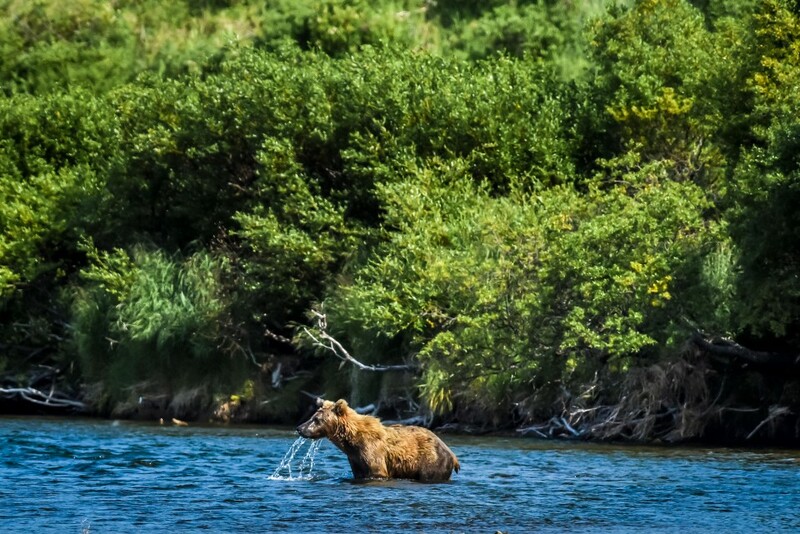 An interesting Brown Bear sighting was one that Dan and Ralph Stevens and I watched fishing for 10-15 minutes. It was a juvenile bear, perhaps 3-4 years old stalking along and then down a high bank looking intently into the river for salmon, then entering the river, submerging and fishing using a strategy we call “snorkeling”. 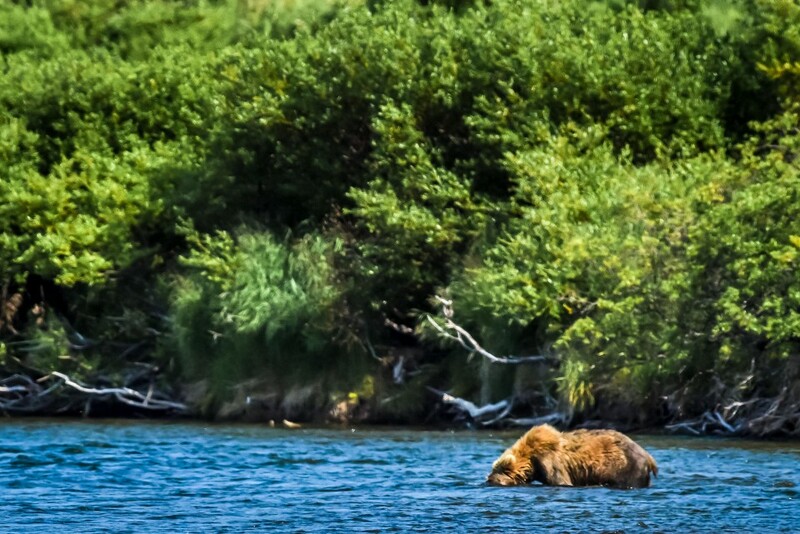 The bear peered underwater moving about the channel and pursuing fish but was unsuccessful, which is not uncommon in deeper water, early in the season, and especially for the younger less experienced bears. We got good looks at the bear from a safe distance. From Geoff and Pete’s boat we likewise heard of a good Bear sighting on a high bank along the river. Fishing was strong right out of camp! 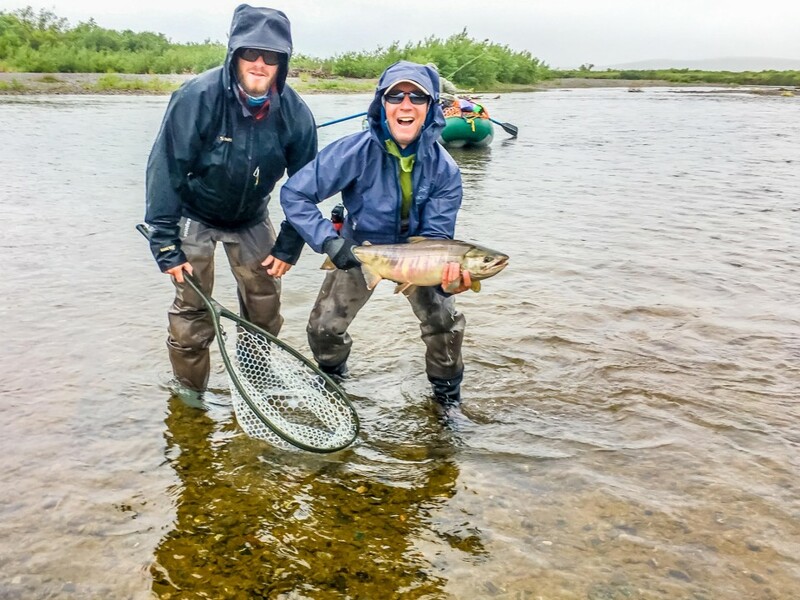 Dan took a 26” chrome Dolly Varden, fresh from the salt. I had to take my sunglasses off and peer closely at it to discern the tiny incipient pink spots. It looked like a Sockeye until closer examination of the pink spots and was in perfect condition. This fish will be one of the dominant spawners this coming October, I’m quite sure! After that fish we released 2 more large healthy Char. The numbers of Sockeye continue to be staggering and this is surely the largest Chum run in the past 5 years. 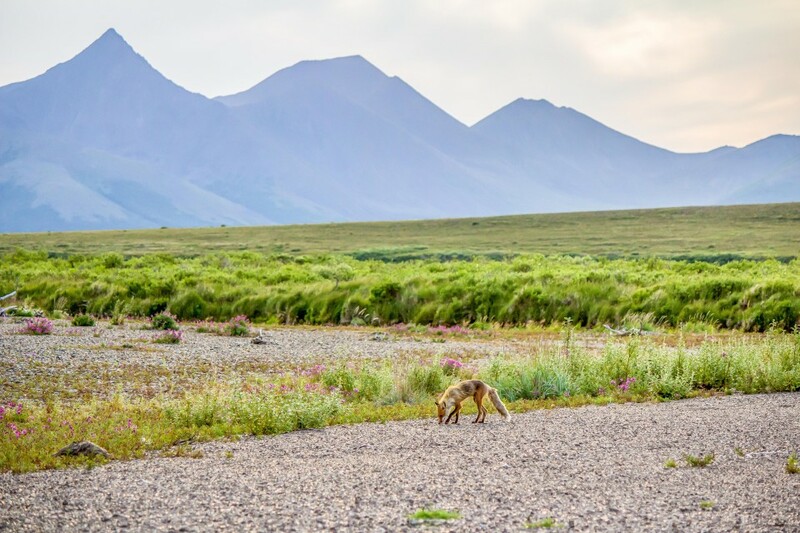 The gravel bar fauna is mainly nesting migratory birds such as Arctic Terns and Greater Yellowlegs and that is no doubt why Red Foxes frequent the bars. The flora is Willow, Grass, Equisetum/ Horse-tail, Dock, River Beauty but not Arctic Poppies, which interest me. Arctic Poppies are quite common just one watershed to the west, (the Kanektok watershed) but not found on the Goodnews. One wonders at this range discontinuity? This day was extraordinary for Paul Eldrenkamp. He fished the mouse all day with JJ on the oars and took a great many fish. Plus Paul reported that he saw a Mink in camp this evening. 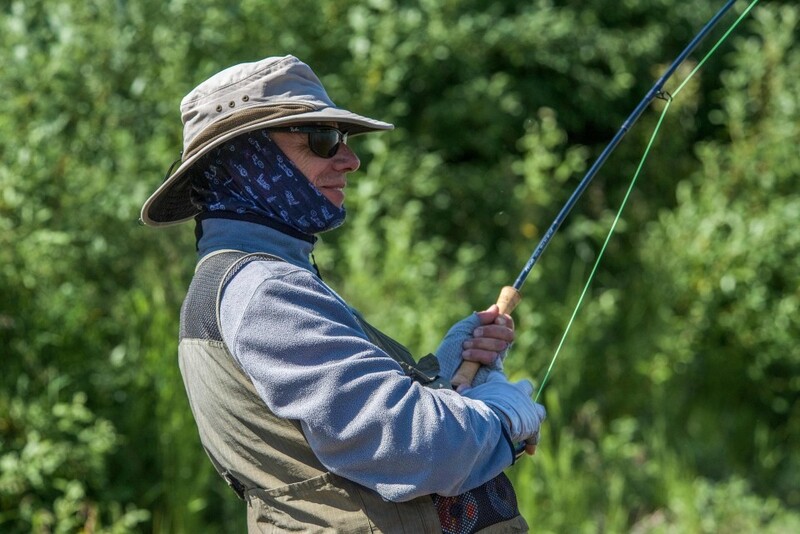 The fishery has changed from a resident Rainbow Trout and Grayling fishery to an anadramous / migrant fishery with salmon in all the pools, the deeper runs continuously pushing upriver past the gravel bars. The strength of the run is staggering. Mike Wyant released a fine 25# King Salmon and others were hooked up to Kings also. Some “Bruiser” Chum Salmon caught and released as well! As the day went on the wind became a significant force and ultimately took its toll on everyone. The fly casters had their casts collapsing against their shoulders and whacking the back of their jackets, and the oarsmen fought to keep the rafts on course and to make forward progress. The wind knots were magnificent. At days end it was nice to get out of the wind in camp! To shrug off the waders, and perhaps have a beer. The menu changes daily but one element remains constant, extraordinarily fresh salmon. 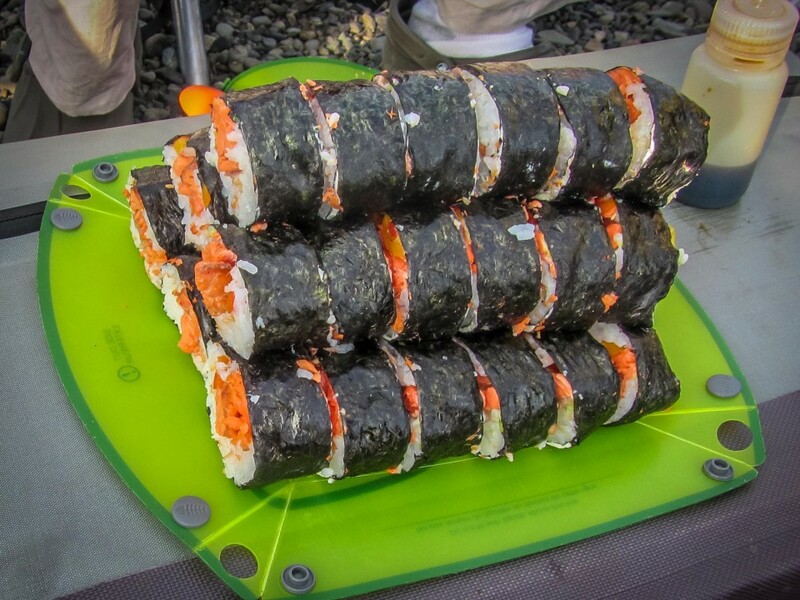 Whether Char Fish Tacos, Jack King steak appetizers, King Salmon curry, or Sockeye sushi. 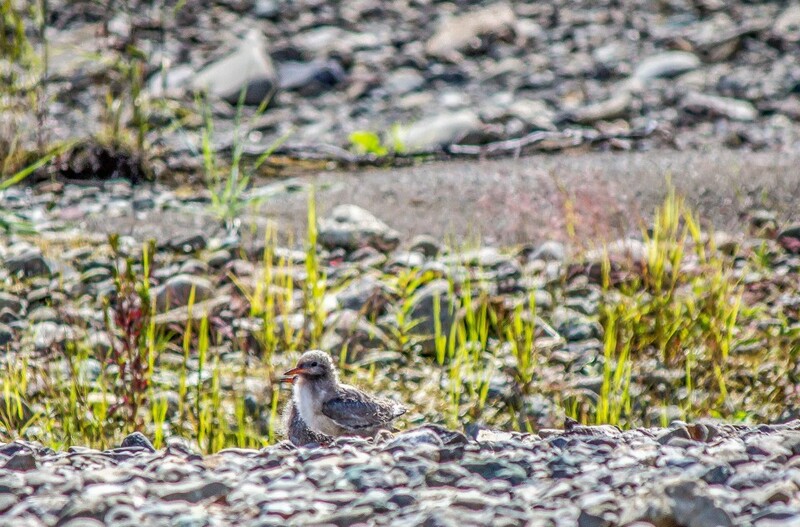 The first Ravens seen this week and the first squadron of Glaucous-winged Gulls occupied a gravel bar below a King Salmon spawning run where it appeared that a fly out lodge had a fish cleaning station. This seems quite consistent with the needs of these larger bodied birds for a dependable source of carcasses for their early summer food. A Red Fox came through late in the evening sniffing at grass tufts as well as near our dry bags of food. The most productive flies this day included the purple egg sucking leech and a trout bead pegged on the leader above a Copper Swan. Last day of travel and we awoke to drizzle beginning at 5:30 am”. With coffee brewing and Biscotti distributed our view of the world gradually brightened and as we broke camp a cow Moose grazed nearby. We loaded our rafts for our final day of fishing while an adult Merlin (falcon) passed overhead and then off we launched downriver. In my raft Ralph Stevens fished a trout bead for Rainbows, taking some and a fine Chum salmon as well. I looked ahead to Brian’s lead boat and saw them release several nice Rainbows. At the most classic and iconic salmon pool in Middle Fork of the Goodnews river on river left, there is a long straight bluff run where Kings hold in very heavy water. 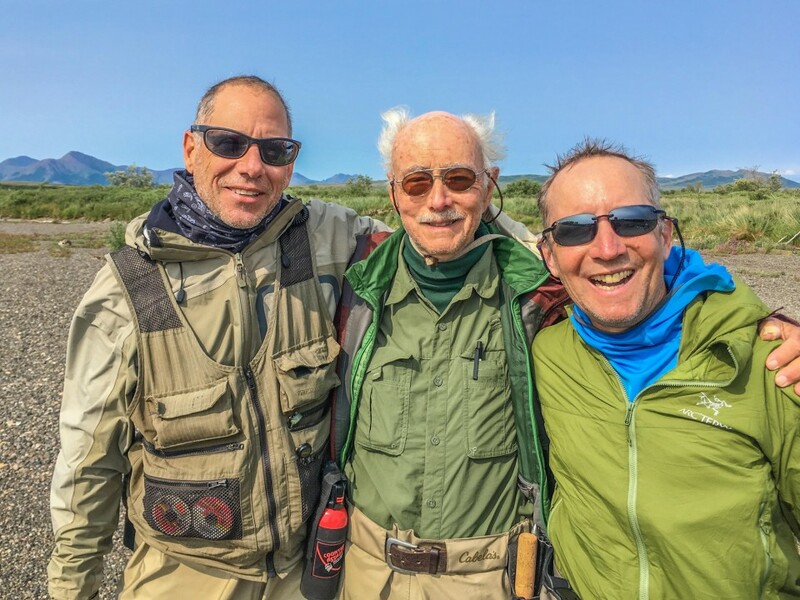 Ralph cast the large weighted Chartreuse and White streamer for all he was worth. 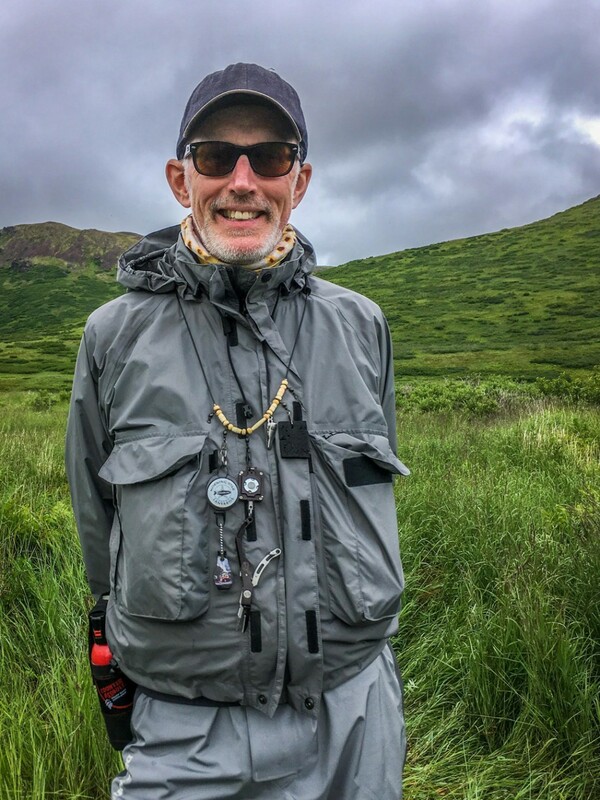 He must have cast 500 times this afternoon and then as if cued up by the fish gods at the last possible moment a 40 pound class King rocketed out of the channel with Ralph’s fly lodged firmly in the corner of it’s mouth. Word’s were spoken to the effect “Oh My God! As the fish leapt clear of the water”. It is so improbable to see something trout shaped, seeming the size of a fire engine. Not the familiar 16-inch trout of Montana home waters. A battle raged for 20 minutes and 3 times the magnificent fish was close enough that the net was readied. And 3 other times we chased the fish downriver by boat or afoot. Finally the hook straightened out and the fish pushed back out into the current. We were all drained yet elated by the spectacle. 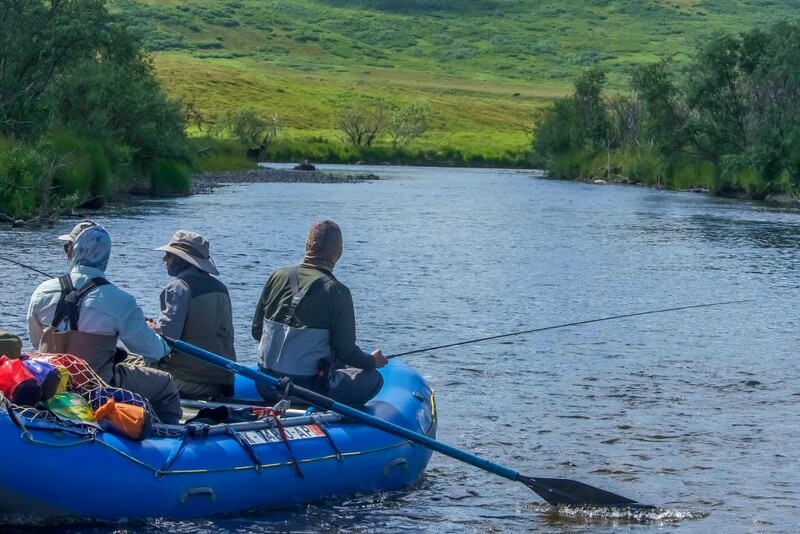 We rafted back out into the current toward our final camp taking and releasing more Kings and Killing 2 Jack Kings for our Salmon Curry dinner. A great week with terrific anglers. Thank you!